A summerhouse in the garden can have a number of uses. Ideal for expanding families and expanding businesses alike. 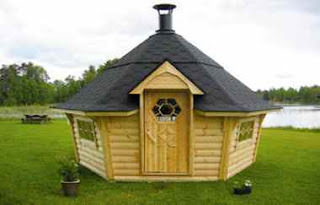 The beauty of a log cabin of reasonable wall thickness is that with our insulation service a summer house in the garden becomes a garden cabin you can use all year round. The following example built in St. Albans a month or two ago was supplied by another manufacturer but we were able to offer the installation service. Insulating the roof and floor of the cabin with 50mm Kingspan insulation provides a good level of insulation from the heat in summer and the cold in winter. A log cabin of this thickness 45mm is usually more than adequate for most uses. A New year and new products for Cabin Living. We have now added our bbq hut range for 2010. Whatever the weather holds this year with a barbecue cabin you can organise a party without worrying about the forecast. For those prone to evening midgie attacks this might also be the answer! Imagine a cosy drink, an open fire, no rain and no pesky insects. Manufactured in the UK with speedy delivery and a full range of accessories. 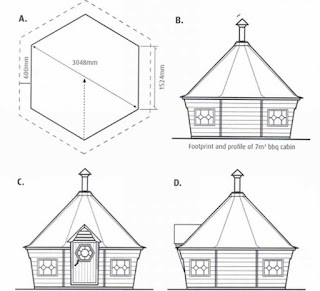 Plan drawings of the smallest of our bbq huts.